This no-prep math escape room is a fantastic way to review 4th grade Measurement and Data! Your students will love working together to solve the MD-related clues in this escape activity. The escape room is digitally controlled and is perfect for laptops, desktops, iPads, Chromebooks, and tablets of all brands and operating systems! No add-ons, extensions, or extra preparation is required: only the internet browser included on your device. 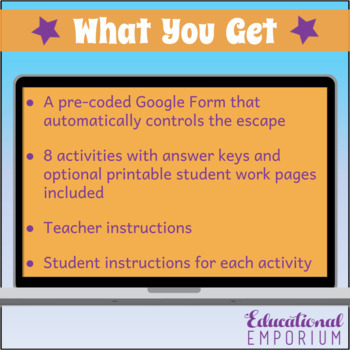 Get this in the ⭐4th Grade Math Escape Room Bundle⭐ to have engaging review activities for every 4th grade math domain! The first "door" of the escape reviews vocabulary from the 4th grade Common Core Measurement and Data domain. -Turn on a computer or tablet for each group (2-5 students per group). -Most 4th graders will complete the escape in about an hour. You may set a timer for one hour to add an element of suspense. 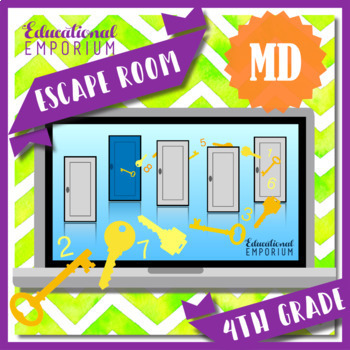 Don't miss my other 4th-grade math escape rooms!